An in-depth look at why American universities continue to favor US-focused social science research despite efforts to make scholarship more cosmopolitan. US research universities have long endeavored to be cosmopolitan places, yet the disciplines of economics, political science, and sociology have remained stubbornly parochial. Despite decades of government and philanthropic investment in international scholarship, the most prestigious academic departments still favor research and expertise on the United States. Why? Seeing the World answers this question by examining university research centers that focus on the Middle East and related regional area studies. Drawing on candid interviews with scores of top scholars and university leaders to understand how international inquiry is perceived and valued inside the academy, Seeing the World explains how intense competition for tenure-line appointments encourages faculty to pursue “American” projects that are most likely to garner professional advancement. At the same time, constrained by tight budgets at home, university leaders eagerly court patrons and clients worldwide but have a hard time getting departmental faculty to join the program. Together these dynamics shape how scholarship about the rest of the world evolves. At once a work-and-occupations study of scholarly disciplines, an essay on the formal organization of knowledge, and an inquiry into the fate of area studies, Seeing the World is a must-read for anyone who cares about the future of knowledge in a global era. Mitchell L. Stevens is associate professor of education at Stanford University. Cynthia Miller-Idriss is associate professor of education and sociology at American University. Seteney Shami is a program director at the Social Science Research Council and founding director of the Arab Council for the Social Sciences. 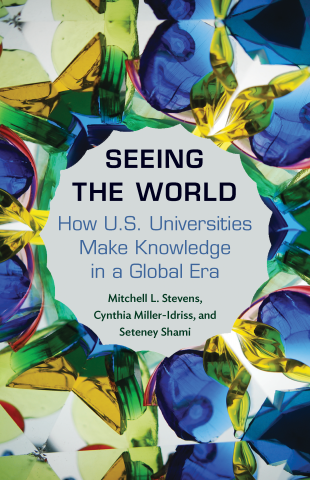 Stevens, Mitchell L., Miller-Idriss, Cynthia and Shami, Seteney, Seeing the World: How US Universities Make Knowledge in a Global Era (Princeton University / Princeton University Press, 2018), https://press.princeton.edu/titles/11198.html.